DW will be presenting its wide-reaching changes and programming highlights for the Arab world at the 9th Convergence Summit in Amman, Jordan on May 22 and 23. DW’s Social Media Manager Julia Hildebrand will be taking part in the conference that is organized by the Arab Advisors Group. DW has increased its focus on regional programming and intercultural dialogue in the Middle East with a schedule that offers 10 hours of Arabic programming and a six-hour block during primetime. This new programming line-up is tailored to meet the needs of the region’s broadcasters with a renewed focus on local partner-ships. The success of “Shababtalk” can already speak for itself. More than 3.6 million viewers were tuning in to each episode in the show’s first three weeks. And the coproduction with Egypt’s market leader Al Hayah has been registering a market share of nearly 15 percent. The talk show brings together young representatives from the democratic movement in Egypt with their German counterparts from youth organizations, political parties and other associations. DW focused on dialogue again with “On the Pulse”. It’s a talk show that brings Arab and German experts together to discuss issues related to democratization, politics, economics, the role of the government, justice and reli-gion. 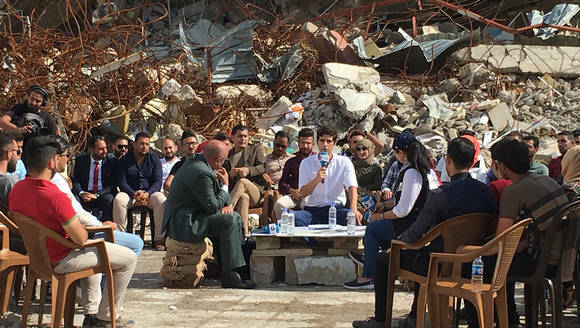 DW's talk show for Arab youth, Shababtalk, recently produced a segment in the Iraqi city of Mosul together with local leaders, NGOs and 250 Iraqi students. Mosul was liberated from the so-called Islamic State (IS) in June 2017, and a lot of the city is still in ruins.